The venerable About Productions, a company devoted to creating original interdisciplinary theater, and educational programs to go with them, is celebrating its 26th anniversary by bringing back favorite productions from their past. One of these, the brief, somewhat surreal salute to Sor Juana Ines de la Cruz, “Properties of Silence,” has been revived at the Carrie Hamilton Theatre, upstairs at the Pasadena Playhouse, accompanied by a salon series of post-production events. The play itself can best be categorized by saying that it is to theater what a Frieda Kahlo painting is to art: representational to a point, then enhanced with the surreal quality of dreams, portents and symbolism. By Theresa Chavez, who directs, Alan Pulner, and Rose Portillo, who portrays Sor Juana, the play meshes the story of the famed scientist-nun with that of a modern real estate saleswoman in Arizona drifting into new realizations about her life with her swimming pool contractor husband. But that’s really just the representational layer. Sor Juana, a 17th Century Mexican nun whose choice of the convent was more about the chance to remain single and to study than about faith, became known internationally for her plays and poetry, but also for her scientific experiments and her vast collection of books. Yet, in the end, the church hierarchy was not comfortable with a nun – a woman – achieving this kind of temporal notoriety and she was shut down. For this play, based philosophically upon two of her writings, we examine the changes of life which provide equal shifts in self-definition. This is then brought to modern times. Portillo gives Sor Juana an elemental internal calm, which works as counterbalance to the upheavals of the modern couple. 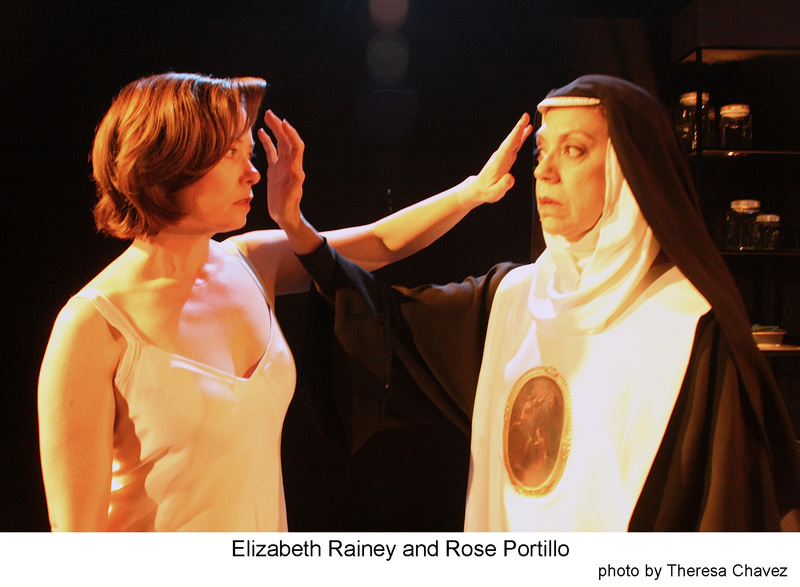 As Barbara, whose discovery that she has followed an unfamiliar path at the end of a familiar day signals a major emotional shift, Elizabeth Rainey literally and figuratively peels the layers from her normal existence until she begins to resonate with Sor Juana’s search for meaning. Kevin Sifuentes, playing both the dominant, success-oriented pool contractor and the voice of church authority, becomes that contrary male image in the face of female self-discovery. His performance is solid, marred only on occasion by the necessity to be a quick-change artist. The underlying structure of the play addresses that moment when one’s life shifts dramatically, but sometimes in unseen ways. The use of ancient philosophical statements, especially Heraclitus’ “No man steps in the same river twice, for it is not the same river and he is not the same man,” guide the piece into larger statements about growth, change, and the finding of oneself. All of this is done with impressive rapidity, as the show comes in at just under an hour. Director Chavez has a handle upon the dreamlike quality of this thing, making walls blur and time periods mesh as only dreams can. Then, as it ends – and after a brief intermission – one can mesh one’s feel for the material of the play with one of the many addendums provided afterward, from poetry readings by local published authors to discussions with various members of the creative team, depending on the day. “Properties of Silence” is fascinating to gradually unravel. Just be aware that the unraveling is necessary, just as much as it would be looking at one of the more profoundly odd Freda Kahlo paintings. 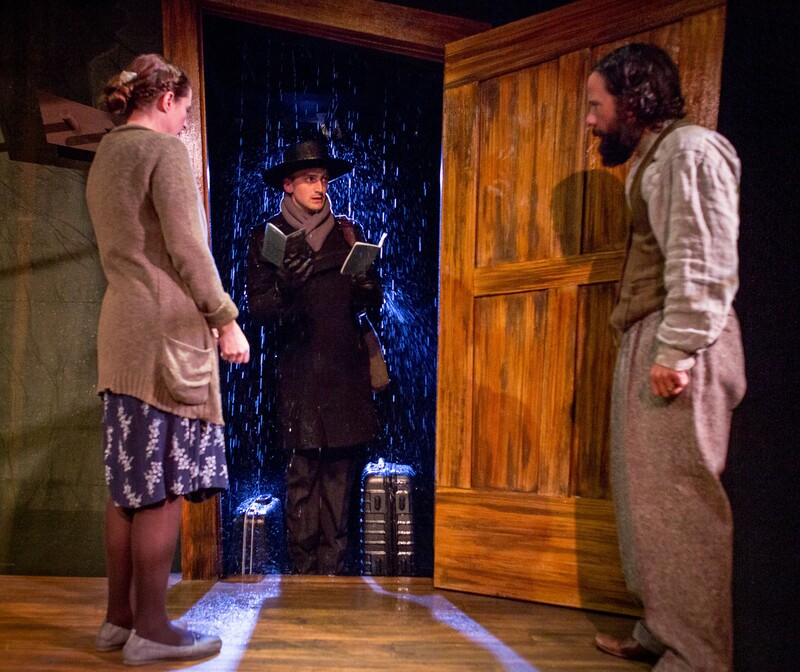 Sara Hennessy, Joshua Weinstein and Shawn Lee star in the FURIOUS THEATRE COMPANY’S rolling World Premiere production of FOXFINDER. In 1934, Lillian Hellman’s first play emphasized the concept – inspired by the rise of Nazism – that a lie repeated long enough, with enough conviction, can eventually be seen as true. Just like “The Children’s Hour” 80 years ago, Dawn King’s new venture “Foxfinder” looks at this elemental concept of indoctrination, propaganda and fear. In a “rolling U.S. premiere” directed by former Furious Theatre Company artistic director Damaso Rodriguez, “Foxfinder” has landed at Furious, back at their home in the Carrie Hamilton Theater. Compelling and intense, it has much to recommend it to those caught up in popular ethos: insidious propaganda, a dystopian future, nature v mankind. Still, the overarching statement being made resonates back to Hellman’s warning: say something untrue long enough, and it becomes a people’s truth. In “Foxfinder,” the concern is productive use of limited farmland, and a government strictly monitoring the efficiency with which each parcel is utilized. Any slacking off, even caused by weather, is liable to lead to an investigation by a “foxfinder,” raised up to look for evidence of the evil and subliminal control of foxes upon the society. With fox infiltration seen as the source of all inefficiency and rebellion, foxfinder investigations are feared, with reason. Shawn Lee and Sara Hennessy are Samuel and Judith, a simple-living farm couple struggling with loss and bad weather, and the oppressive fact that a foxfinder has come. Joshua Weinstein creates the rigidly indoctrinated foxfinder William, struggling with his own humanity even as he carefully documents the human failings of his subjects. 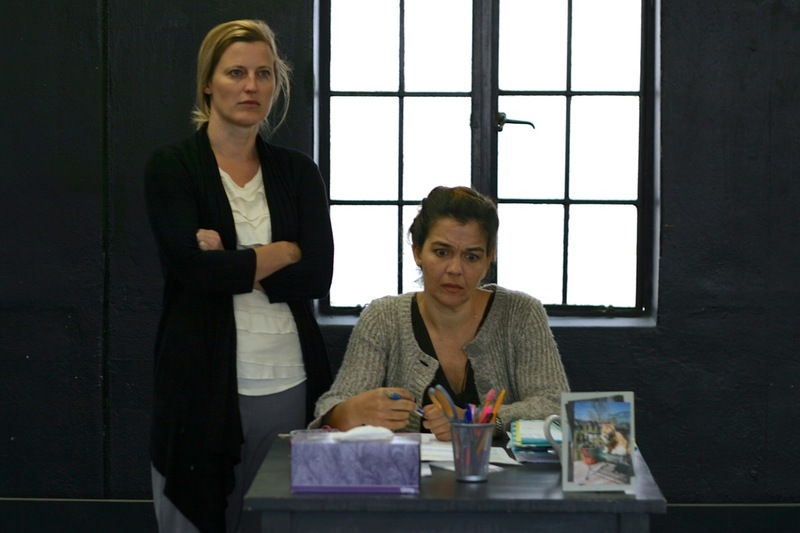 Amanda Soden, as their neighbor Sarah, supplies the reasoning and therefore rebellious counter argument, putting her family at risk by articulating the pointlessness of the foxfinder’s purpose. Lee creates in Samuel a man desperate for something to give his life purpose, confused and self-isolated. Hennessy’s careful, protective Judith provides what balance there can be in a household of constant stress. Soden’s inquiringly dangerous Sarah, on stage in sudden spurts, speaks to the passions which inspire underground rebellions – sympathetic, hopeful, and human. Yet, though the entire story proves compelling watching, Weinstein’s indoctrinated automaton discovering his humanity creates the greatest fascination. Initially a man of fascist passion, William’s fights to cling to his proud asceticism while overwhelmed with very human desires makes the entire piece work as a whole. “Foxfinder” is not new news. Fascistic authoritarianism, though in this instance sparked apparently by climate change, has been worked and reworked over time, and perhaps better. The message at the core of the play, be it suspicion of blind belief, the unnatural condition of denying one’s essential nature, or the compelling power of a well and sincerely told lie, has also been seen before. Still, what sets this production of this play apart is the quality of the performance, as the actors create characters of rounded familiarity. Add to this the taut direction by Rodriguez, which keeps one on the edge of one’s seat, and the artistry of those whose work literally sets the stage for what appears. The minimalist but very effective set by Kristeen Willis Crosser allows effective changes of scene, aided by her facile lighting design. Doug Newell’s ominous original music, and general sound design help build the feeling of dread so necessary to the piece. Gregory Pulver’s contrasting clothing between peasant-like country folk and tightly formal official defines character before a word is spoken. “Foxfinder” runs roughly 90 minutes without intermission which is a necessity. Frankly, breaking the sense of disquiet and rising emotion would dilute the most important elements. Furious Theater’s last two productions have removed the standard proscenium-based interior of the Carrie Hamilton, turning it into a modified “black box” with moveable seating. This too allows the action to be closer, and the feeling more intense. It is completely appropriate to this company that Furious Theatre’s return to the Carrie Hamilton Theatre upstairs at the Pasadena Playhouse should come accompanied by a kick in the gut. Pushing boundaries, observing and decoding confrontation, and always the challenge to think – perhaps even to the point of having to look oneself in the mirror in a different way – is what Furious is about. Most assuredly the Los Angeles-area premiere of “Gidion’s Knot” by Johnna Adams provides all these things, and at Furious it provides them up close. In “Gideon’s Knot” perhaps the most complicated kind of “knot” presents itself: Gideon, a 10-year-old boy, has killed himself. His mother shows up at the door of his 5th grade classroom to keep the parent-teacher conference she’d agreed to before the tragedy. There she works to tear up, or apart, the teacher she blames for her boy’s death, yet must confront the boy the teacher knew and she did not. In the end, there is fury and also hints at an answer, but it may not be the one the mother can handle. Director Darin Anthony brings his audience intentionally, disquietingly close to the action, as the two women wrestle with each other and with tragedy. They sit in student desks around the edges of Aaron Francis’ recreated classroom, where Miss Clark is grading papers. The tears, the anger, the struggle in the midst of emotional upheaval to deconstruct a horrible event, all happen almost within arm’s length. This is also the point. This isn’t happening somewhere else. It is something shared. Immediate. Paula Cale has the true aura of an elementary school teacher as Heather Clark: gentle but firm, emotionally connected to the doings in her classroom. Indeed, her character’s emotionalism is the weakness this parent-nemisis seeks to use to advantage. Still, she carries an underlying sense of solidity – of being on her home turf – which allows her some balance against the attack. Vonessa Martin creates the furious, distraught Corryn Fell, Gideon’s mother, as a person caught between intellectualism and a need to both vent and blame, even if that emotion is also smoke-screen. As she circles the focus of her anger, and strikes at the most vulnerable points, she also allows us a physical sense of the chinks in her own armor. The two play extraordinarily well off of each other, keeping the tension of this play roaring throughout – but a tension which has the audience in a constant state of reevaluation. “Gidion’s Knot” asks complicated questions, and lays the groundwork for just as complicated answers. It never talks down to its observers, leaving bits of that very knot to be unraveled slowly, just as it must be by the two women confronting each other in the script. And that is what one expects from this company: excellence, tension, things to think about and a few things left hanging in the air one breathes. Be aware, even the seating is not particularly about comfort. This play is performed without intermission, which makes complete sense as there is no way one could interrupt the emotional build happening in real time. The Los Angeles-based company Impro Theatre has a delightfully fresh approach to the art of improvisation. 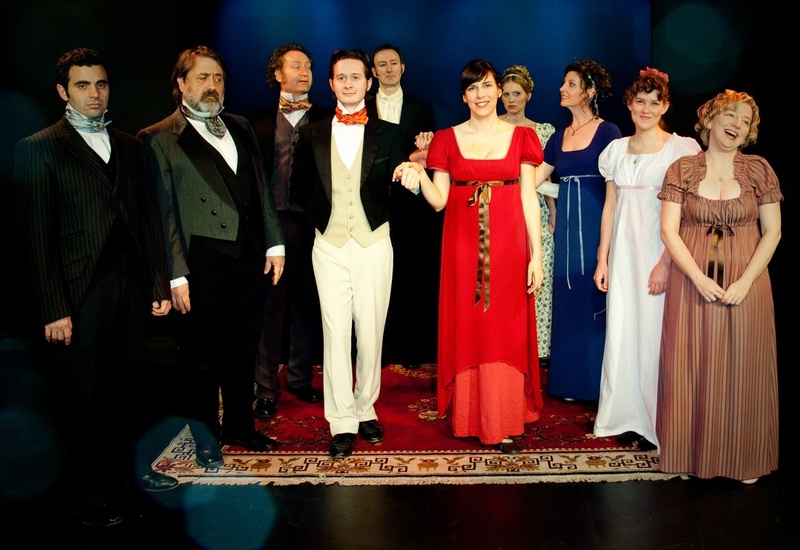 An “Unscripted Repertory” theater company, Impro concentrates on recreating the feel of important literary or dramatic voices in completely original, unscripted and individual 90-minute plays. Each is based on one or two audience suggestions, added to the tone present in whatever artist’s work they have chosen to represent. At the Carrie Hamilton Theater, upstairs at the Pasadena Playhouse, the Impro has unveiled “Jane Austin Unscripted.” There they create a new play every night, utilizing a rotating crew from their stable of performers both onstage and providing sound and light effects. All they promise is that “there are likely to be some sisters who seek romance, and some men who might provide it.” After that, one buckles one’s seatbelt to see what will happen. The concept is a most ambitious one: to make a completely new play every night, staying in tone and in touch, handling individual sudden inspirations, and being funny enough to make an audience collapse in laughter without losing one’s sangfroid. That this is accomplished seems just short of a miracle. That what one remembers is cleverness, continuity and that most freeing form of laughter says most clearly what should be said about the enterprise. The evening I attended, a suggestion that allergies be an innocuous topic of discussion lead to a story line developed around a Regency era girl who could not leave her country home for fear of exposure to “nature.” She was joined by her rather obvious sister, and the story began with the romantic ambitions of her parents when a handsome young man and his overly worldly sister arrive at the manor nearby. All very Austin, as is Sandra Burns’ essential setting and costume elements. Still, this cannot possibly convey the level of sheer (and consistent) hilarity this group delivered. Onstage that night, of the 14 regulars and 5 “special guests” they could have called upon, were Tracy Burns, Kari Coleman, Lisa Fredrickson, Jo McGinley, Nick Massouh, Paul Rogan and Floyd VanBuskirk. All managed an impressive balance in the shifting sands of their concocted story, not to mention that aforementioned and admirable ability to keep a straight face in the midst of well-crafted ridiculousness. Lissette Jean-Marie and Eliot Hochberg improvised lights and sound – most impressive during Burns’ pantomimed horseback ride, but always a presence. Yet, you will not see what I saw. I wouldn’t either, if I returned, for every night is a completely new tale, genteel and Austinian though it might become. What impresses most is the ability to prolong a single thematic structure in such a long improvisation, with such exquisite timing. This is the core of the pleasure of “Jane Austin Unscripted”: at the end of an admittedly long week, the waves of of cheerful laughter this company provides proves a welcome balm. Long ago I knew a woman who spent her youth working as an usher at the theater in Boston where an enormous number of now-famous Broadway musicals conducted their “out of town try-outs.” She used to tell fascinating stories about what these great works looked like when they were newborns, and how they changed during their run at that theater. Indeed, I also grew up with similar tales told by an original chorus member of “My Fair Lady.” Fascinating to consider such a thing in its stage of growing pains. Now a brand new musical with much to recommend it has surfaced upstairs at the Pasadena Playhouse. There, in the Carrie Hamilton Theatre, one may meet “Bend in the Road,” a musical by Benita Scheckel and Michael Upward based upon the classic novel “Anne of Green Gables.” There are a few evidences of the same growing pains referred to above, but by and large this production shows great promise. One may be watching the birth of a hit. The tale is the classic heart-warmer. An earnest and somewhat headstrong orphan girl lands at the door of two older, unmarried siblings who raise her. She develops a fast and enduring friendship with a neighbor girl, and goes head-to-head with the smartest boy in her one-room schoolhouse. As she grows and learns to be a part of her community, her essential good-heartedness rubs off on those around her – even the crusty, nosy widow-woman nearby who initially works to ruin her. And all this potentially gooey stuff works in “Bend in the Road” due to a crisp script, taut direction, attractively on-point songs and an impressive lead. Indeed, it is the tinge of mischief and obstinacy in Alison Woods’ Anne which energizes the entire piece. This Anne operates from a sure conviction of her own rightness even when she’s not. You see it in her eyes, and that gives the piece teeth. The songs also stand out. They are hummable, and some have considerable power. Indeed, I’d put “Kindred Spirits,” the song uniting Anne and her best buddy Diana, right up there with “For Good,” the signature song of the massive hit “Wicked.” It has a similar quality of both topicality and universality, and a similar pop-catchiness. Only one piece, the last before intermission, needs real work. Overly complex, it is an attempted fugue which becomes dissonant and somewhat unintelligible instead. Otherwise, it’s quite a score. This is enhanced by a fine ensemble, who give heart and intensity to the music, and create details within the town in which Anne grows up. Christopher Callen warms to her work as Marilla Cuthbert, the woman who takes Anne in, though her vocal quality sometimes hints at flatness. Don Margolin provides the necessary warmth as Marilla’s soft-hearted brother. Barbara Niles finds a nice balance of heartache and self-righteousness as the snippy neighbor. Add to these Melinda Porto’s charming Diana, and Christopher Higgins as the increasingly interesting and youthfully handsome Gilbert, add in a bevy of amusingly snippy school girls and bouncy boys, and you have a cheerful frame for the story. As for staging, under Scheckel’s direction there is an attractive flow to the thing. Though very low-tech, this episodic tale is set in such a way that it moves from scene to scene with precision and energy, so the story never slows. The tiny stage is full, but not crowded, in part because everyone onstage is there with intentionality: they all have something to do, and someone to be. Projected scenes using artwork by Anna Scheckel provide an effective essential set, along with quick-moving panels which cover the multitude of necessary locations. Indeed, only a roof-walking scene, worked out behind the projection scrim, is comparatively ineffective. The projector itself is seated too high, so the glow from its bulb, rather than aiming above the audience’s heads, hits some audience members in central seats right in the eyeball. Yet, these are easy to fix. Past such nitpicky details, “Bend in the Road” works. The story is sweet, but not saccharine. The music proves catchy and interesting. Kevin Lee’s choreography feels organic to the time and characters. There is a cohesive vision at work here, and it shows. 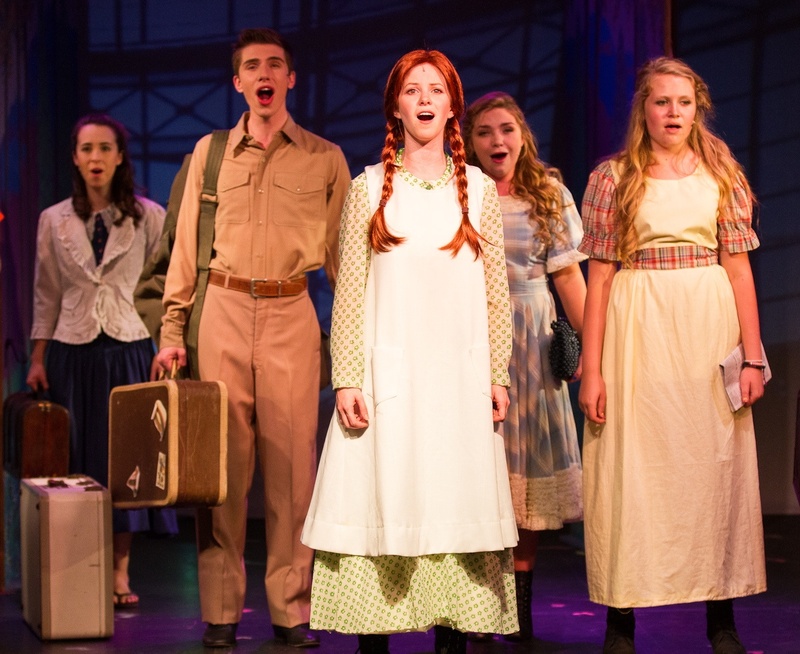 This just might be Broadway the old fashioned way: a tuneful show with endearing characters and a touching ending that will send you out smiling into the night. It is neither cutting edge, nor deep social commentary, but satisfying nonetheless. A little nip and tuck, and it may be ready for bigger things. A new organization has appeared in the southland. SAIPRO, or Serving Artists in Process, operates under the Pasadena Arts council EMERGE Project to encourage those making the stretch into new ventures in the artistic world. One of these ventures has landed at the Carrie Hamilton Theatre, upstairs at the Pasadena Playhouse. Called “Prison is Where I Learned to Fly,” it is the culmination of connecting a fledgling performer’s family story, a dissertation for a PhD in Mythological Studies and a solo performance artist doing a workshop. Though still a work in progress, it has fascinating potential. The writer of the dissertation, and the fledgling performer, is Rochelle Duffy. She grew up in Duarte in a family with 17 children. The pressures of this alone, mixed with her mother’s consistent depression and her father’s literally in-your-face discipline style would be theatrical enough. This tale, however, focuses on one brother – Ronald Patrick (all 17 have names that begin with R) – and his struggles with abuse, addiction and incarceration. It was through letters with him that Duffy began to reconnect the dots of her family world. It was by asking her other siblings how they remembered things that she helped Ronald to heal. Director, and Duffy’s guide in many ways, Debra De Liso has helped Duffy turn all of this into a condensed memory piece, flitting from a gathering of siblings to items from their past, to letters back and forth between Duffy and her imprisoned brother. She has also cast Duffy to play herself, and then filled the rest of the cast with 10 or 11 actors who bounce back and forth between the various brothers and sisters (there were 6 boys and 11 girls) to bring the memories to life. John Marzilli plays Robert Patrick, and the minimalist set contains Duffy’s study, Robert’s cell, and a prison visiting room where the siblings have gathered. It’s an interesting exercise. Certainly, the stories told run from interesting to compelling. What problems arise come partly from Duffy’s difficult stance – certainly for someone new to the art form – of playing herself telling a story as if she is acting. It takes a while, as an actor, to get to the point where you understand that intensity is not often best indicated by raising the pitch of one’s voice higher and higher while speaking. Unfortunately, Marzilli responds to her by doing the same thing, starting at such an intensity that soon everything is played with such power that his most wrenching revelations have nowhere further to go, emotionally. Still, that doesn’t keep the story from being an interesting one. Every family has ghosts and legendary stories, and this one is no exception. It’s just amplified by its size. The ensemble cast creates a series of memorable characters and De Liso’s choreography allows one to keep the important people separate. If you are curious, and there is much to be curious about, the show runs for one more weekend. If you are interested in this new organization, and the support of fledgling artistic work, much information about that is available at the theater as well.